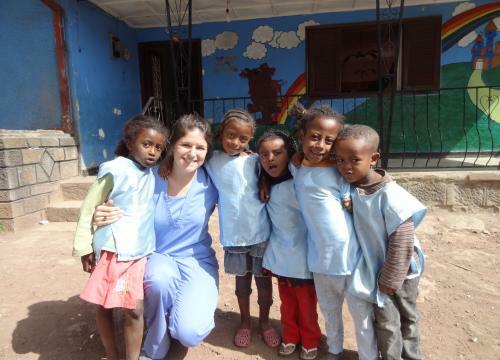 Testimonies from our Volunteers | Strong Hearts International, Inc. Some may view my time volunteering as monotonous days full of patty-cake, hairstyling, hand holding & teeth cleaning. However, for me it has been 15 amazing days that have fulfilled a childhood dream. I have spent 3 unforgettable weeks doing dental hygiene volunteer work. I spent most of my time at the preschool, but also visited the primary school & hospice.Who knew that tucked away behind 2 unassuming, metal doors were 100 inspiring, joyful children. The amount of interaction that can come from a simple smile, laughter, & a few Amharic words is overwhelming. The kids are absolutely beautiful & have certainly taught me more than I could ever teach them. While they may have a new toothbrush & know to brush twice a day… that seems insignificant when compared to the depth in which they have touched me. Their genuine, innocent smiles are heartwarming. I didn’t come with the motive of changing lives, but rather simply wanting to spread smiles. I am truly blessed to have had the opportunity to volunteer with such a wonderful organization. The staff are amazing & their work is selfless. I will carry the memories (and hundreds of “photos”) with me forever. Please know that you helped me fulfill a childhood dream and I could not be happier!